When NASA initially released the Visualization Explorer app in the summer of 2011, it was limited to those using an iPad. It is now being offered to all devices running iOS 5.1 or better. Since its release, there have been over one million downloads of the free app, though NASA expects that number to grow considerably since it will now be available to users on iPhone and iPod Touch. Twice a week the app will be automatically updated with a new story involving NASA’s latest research results in astrophysics, heliophysics, Earth, or planetary science. The stories include NASA’s renowned photography, audio explanations, animations, videos, and introductory descriptions with links to more information. Most of the content is sourced from NASA’s Scientific Visualization Studio, Earth Observatory, and Science @NASA, though other NASA outlets are occasionally used. The app allows you to mark certain stories as your favorite, making them easy to find at a later date, though there is also a search function that allows you to browse all 275 stories since the app’s launch. You are also able to share content through Facebook, Twitter, SMS, or email so that you can engage family, friends, or co-workers with the latest stories from NASA. All of the content available on the iPad app will be on the iPhone version as well. The only difference between the two is a modified format that makes navigating a bit easier on a smaller screen. Take a look at these two screenshots from the March 12 update “Planets Everywhere,” which describes the process by which scientists use the Kepler Space Telescope to discover exoplanets. 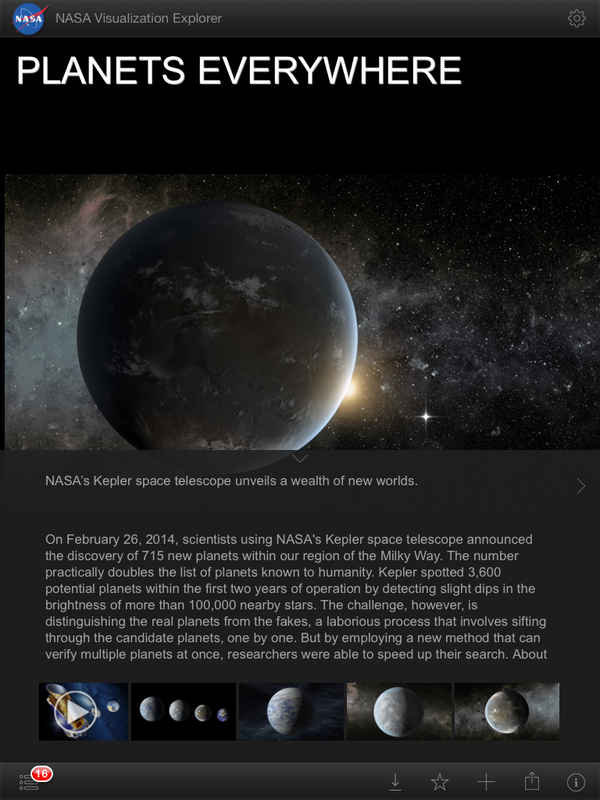 You can get the app directly from the App Store or from the Goddard Space Flight Center’s website. There is currently no word on if or when this app will be available for those using the Android platform.